Published in 1854, it details Thoreau’s life for two years, two months, and two days in second-growth forest around the shores of Walden Pond, not far from his friends and family in Concord, Massachusetts. Walden was written so that the stay appears to be a year, with expressed seasonal divisions. Thoreau called it an experiment in simple living. Walden is neither a novel nor a true autobiography, but a social critique of the Western World, with each chapter heralding some aspect of humanity that needed to be either renounced or praised. 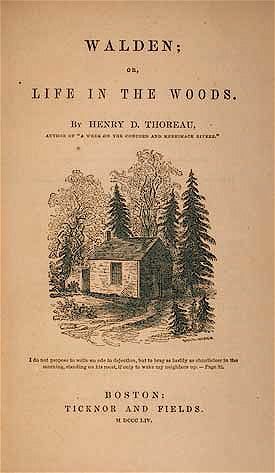 Along with his critique of the civilized world, Thoreau examines other issues afflicting man in society, ranging from economy (the first chapter of the book) and reading to solitude and higher laws. He also takes time to talk about the experience at Walden Pond itself, commenting on the animals and the way people treated him for living there, using those experiences to bring out his philosophical positions. This extended commentary on nature has often been interpreted as a strong statement to the natural religion that transcendentalists like Thoreau and Emerson were preaching. More than a century later, Walden remains a touchstone for Americans seeking to “get in touch with Nature” and is a major cultural icon. It has been parodied in the Doonesbury comic strip and emulated in Walden Two by B.F. Skinner. Walden is also parodied in The Simpsons (when Homer imagines living in the woods and writing a book about how much he misses TV) and in an episode of South Park, in which Cartman crosses out Thoreau’s name and writes his own in an attempt to submit Walden as a school assignment. See also Walden Three, a non-profit educational foundation that promotes sustainable societies. The pond itself is a tourist attraction, as well as a center of controversy over nearby development – thus demonstrating the very tension between natural and man-made pleasures that Thoreau explored in his book.